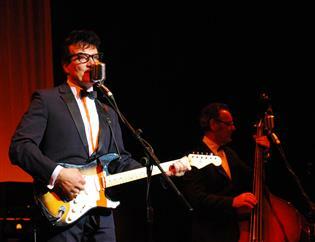 Relive the Rockin’ 50’s music scene. Clutching a Fender Stratocaster, sporting a pair of heavy-rimmed glasses, and sounding exactly like Buddy in his heyday, a legend is reborn. This all new production celebrates an artist who shot straight into the limelight as soon as That’ll Be The Day hit the radio. Though his career was short, this one-man powerhouse gave the world a stack of hits that will never be forgotten.